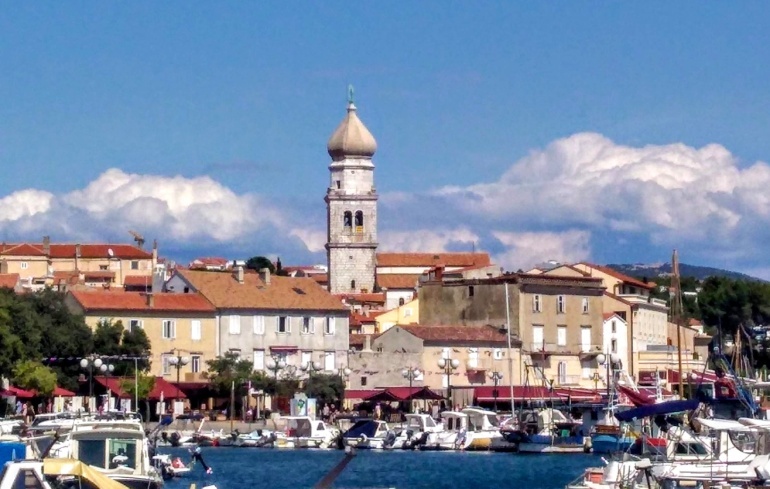 The island of Krk, considered one of the most attractive destinations in the Adriatic, is where the international airport is located so we spent our time there rather than compete with the cruise ship crowds that often jam the narrow streets of Rijeka. Its mild climate, good geographical position and variety of natural and cultural beauties gave it, even in ancient times, the name “Insula Aurea” (golden island). 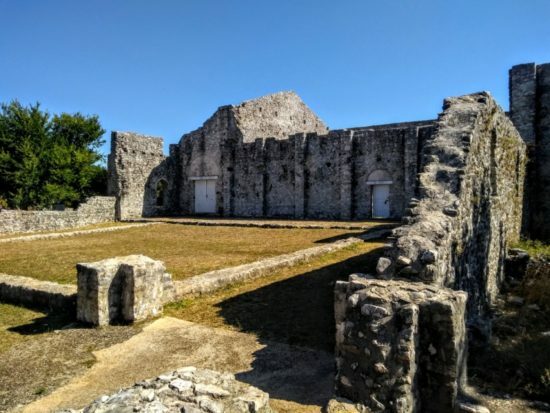 Its cultural heritage has given it another name – “the cradle of Croatian culture.” Our first stop was in the nearby village of Omisalj which encompasses what was once the Roman settlement of Fulfinum – a town built for retired soldiers who had served the Roman emperors Vespasian, Titus and Domitian. Here we visited the ruins of the 5th to 6th century basilica in the archaeological park Mirine – Fulfinum. Many graves were discovered beneath the vestibule of this complex, including a completely preserved in situ sarcophagus. Winemaking in this region of Croatia dates back at least 2,000 years. The Roman historian, Pliny the Elder, credits the longevity of Nero’s mother to her exclusive consumption of wines made here. In the 1800s, the phylloxera epidemic wiped out most vineyards in Europe. Before this devastation, more than 11,000 acres on the island of Krk were planted in vines; now, there are just about 370. Today, Vrbnik is best known for its claim to have “the narrowest street in the world” and for the golden-yellow wine which is grown only here – zlahtina. This varietal was introduced on the island of Krk at the end of the 19th century and to Vrbnik valley between the World Wars. The name of the wine comes from the adjective zlahten, which in Slovene means “noble”. 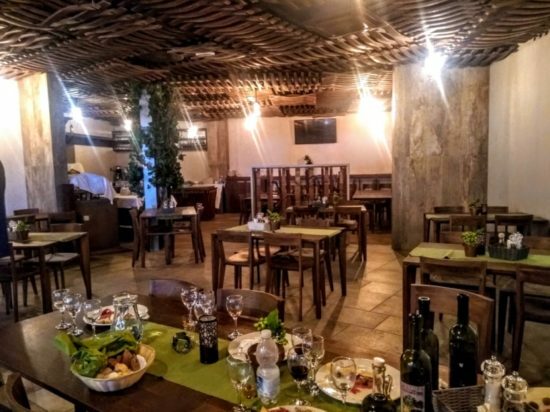 In Croatia, wine tasting takes place in a konoba, a Serbo-Croatian word describing an establishment which offers local food and wine in an authentic atmosphere. Katunar, on the way from Omisalj to Vrbnik, is one of the largest family-owned konoba on the island of Krk. Until the early 1990’s, all vintners on the island took their fruit to the local cooperative to be made into wine. With the surging popularity of wine, the Katunar family broke away and invested in new equipment and technologies that allowed them to better control their destiny. At the same time, the family demonstrates a deep respect for traditional winemaking methods; they are the only winery which makes a sparkling wine using the Charmat method typically associated with Italian Prosecco and they have recently begun experimenting with the ancient method of fermentation in large earthen amphorae. We were greeted with a glass of sparkling wine by the family patriarch, Ivan; his son led our guided wine tasting which included pairings with the mildest sardines I’ve ever tasted and a fish pate which tasted a whole lot better than it sounds. Once in the town of Vrbnik, we visited Vinotel Gospoja (gospoja is a respectful Slavic title for a female), the first wine hotel in Croatia. 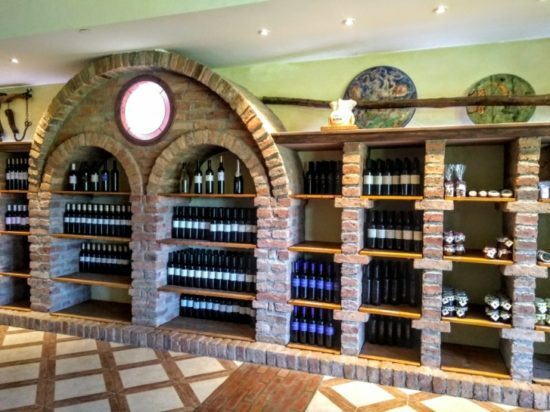 In 1995, Ivan Toljanic founded a winemaking cooperative and named it after the nearby Church of our Lady (Gospoja) of Health, built after a cholera epidemic as a place to offer prayers to the saints who offer protection from infectious diseases. His children invested about $36MM and, in August, 2016, opened this unique property which connects five old houses, rising like stacked sugar cubes above the town beach in colors of grapes, which represent the 5 Croatian winegrowing regions. This boutique hotel offers 22 rooms, each named after an indigenous wine varietal, with a total of 58 beds. Here we enjoyed another wine tasting paired with local artisan breads, cheeses and charcuterie. On the way back to our vehicle, we visited the Church of the Assumption of Our Blessed Virgin Mary which sits like a crown on the highest ground in Vrbnik. 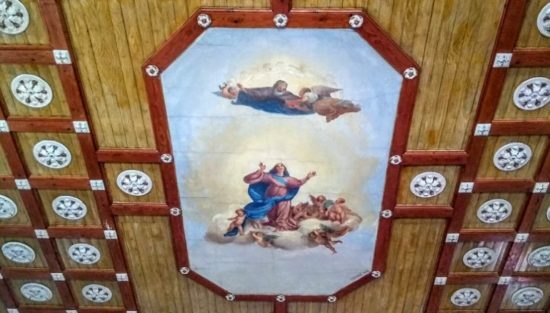 The painting on the coffered ceiling in this church is modeled on one of Titian’s most famous works, the Assumption of the Virgin altarpiece, which still stands in the house of worship for which it was created – the Basilica di Santa Maria dei Frari (often simply referred to as the “Frari Church”) in Venice. Adjacent to this church is a renaissance bell tower dating from the 16th century and the Museum of the City of Vrbnik. Our final stop was the town of Krk, the island’s administrative, business and educational center. Krk is a fortified town, encompassed by city walls with four gates which, based on an inscription from the first century B.C.E., we know date back at least two millennia. In the mid-first century B.C.E., Julius Caesar and Pompey (married to Caesar’s daughter!) contended for control of the Roman Republic. An important naval battle between their forces took place off the coast of Krk town in 49 B.C.E. Caesar eventually prevailed, Pompey was assassinated and the Roman Empire was born. The well-preserved walls one sees today are from the 14th and 15th centuries. We just missed the 3-day Krk Fair (August 8-10 each year) which transports attendees back to medieval times with festive costumes, musical programs and a mock naval battle celebrating Krk’s history.